I am standing in a sun-splashed meadow, feeling as if I could be in a faraway enchanted place. There are grassy undulations; the kid in me wants to lie down and roll over and over. I keep thinking of the lines from the poem by Federico García Lorca: Green, How I want you green. / Green wind. / Green branches. Everything is so aromatic. There are coast oaks and sycamores and wild grasses and that signature smell of warm sage. I forget that I am in deepest L.A., in the Westlake neighborhood adjoining downtown, as this is the prettiest park I think I have ever seen in the city—or certainly one of the loveliest. Vista Hermosa is a 9.5-acre haven that opened in 2008. It’s traversed by winding paths and streams, and you can catch the skyline as you meander. 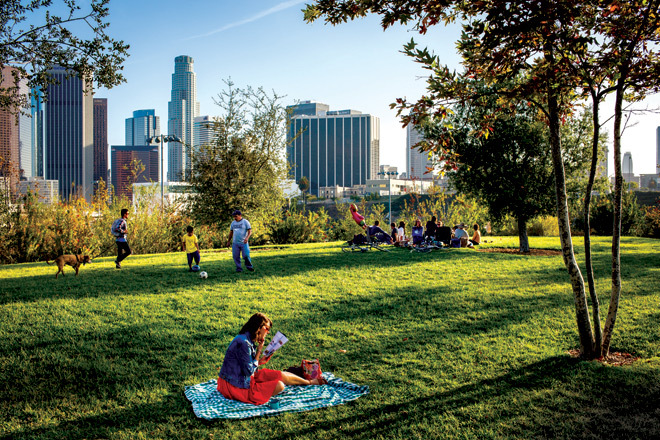 Designed by local landscape architect Mia Lehrer, the space is transportive, doubly so when you know that it is the first public park to be built in this dense pocket of Los Angeles in more than a hundred years. I have, walking through it, one of those corny shivers of civic patriotism and gratitude because someone—a fair amount of people, actually, from politicians and philanthropists to activists and environmentalists—is trying to beautify and salvage this piece of earth we call home. Then there is the newly refurbished Echo Park Lake, which was unveiled last summer after a two-year, $45 million face-lift. My friends on that side of town have been swooning over the beautifully clear water. I passed it one day without intention; I happened to be going down Glendale Boulevard and looked over, the lake shimmering in the noon sun, a few yellow paddleboats floating along. It was like a dreamscape out of an old L.A. movie. I found a place to stop and watch for a while and muse about the happy turn of events. Perhaps the most gratifying are the little oases that have been tucked into the neighborhoods of East and South L.A. as part of the 50 Parks Initiative. Nineteen have been built so far. I tour a handful of them with my friend Judith Kieffer, who is the executive director of the Los Angeles Parks Foundation, a nonprofit that sprang up to help provide enhancements the Department of Recreation and Parks cannot afford: soccer fields and solar lighting, walking paths and water conservation devices. The ones she shows me in South L.A., on 76th and 97th and 105th streets, are quarter-acre parks, each with a $350,000 price tag. They are clean, neat, appealing refuges built on lots where foreclosed or abandoned houses have been scraped off. They have lights and unobtrusive fences (the gates automatically lock at night), shiny new play equipment for the kids and exercise machines for adults. They are the products, like their bigger, flashier cousins, of public-private partnerships that are changing L.A. dramatically. Grand Park, for example, was a joint venture of the city and county, but it’s the nearby Music Center that’s responsible for the programming and entertainment as well as for maintenance and security. Closer to home I visit the just-opened Tongva Park, 6.2 acres next to Santa Monica City Hall and a couple of blocks from the beach. Designed by British-born landscape architect James Corner, who did the much-admired High Line in Manhattan, it can look on first glance a bit tough-minded, a lot of wide paths and hardscape. But once you get inside, the design is as imaginative as that of Vista Hermosa—these are both, one recognizes, the work of artists—if less overtly green and sensual. Corner has added gentle slopes and contours to what was once a flat parcel. You can round a corner and be surprised by a sibilant fountain or the children’s playground, which has a beckoning water feature: erupting spouts that kids can dance through. There are also viewing areas, designed as lacy, curving metal canopies, where you can stand and watch the ocean. Like Lehrer, Corner uses native plants: oaks and sycamores and, my favorites, not-exactly-indigenous olive trees. Presiding magisterially at the northern border is a huge fig tree, nicknamed Morty, which has been there at least 80 years. It has become my touchstone. On my long walks I will go by and feel its bark and say a prayer or ask forgiveness for a transgression, real or imagined, in a park that has now become one of my secular chapels. I am admittedly giddy about all these parks. I have added them to my tourist itinerary when friends come to town. But I am reminded of what Judith said to me. Parks are a bonus for those of us who have decent jobs and houses and backyards. They offer us breathing space, visual treats, a bench during a midday walk or weekend hike. But for those who struggle to make ends meet, to raise families and pay rent, parks are something more. They are necessities, not only places to kick a soccer ball around or throw a softball but to celebrate birthdays and holidays, the wooden tables laden with picnics. Judith’s words have stayed with me when I am walking or driving by and see a multigenerational gathering in a park, children tumbling, women laughing, dogs yapping. I am increasingly aware of how essential these retreats are, as the city has become more complicated, crowded, and economically divided; in fact, they provide one of the few places where this division has a chance of melting away.